SAN FRANCISCO – The California Water Association (CWA) has been recognized as ‘Corporate Member of the Year’ by the Rainbow Chamber of Commerce Silicon Valley. CWA represents 101 water utilities throughout the state that are regulated by the California Public Utilities Commission. The honor came during a January 25 “Celebrating Success” event in Santa Clara, during which the chamber recognized CWA for “outstanding contributions and service to the Lesbian, Gay, Bisexual and Transgender communities in the San Francisco Bay Area,” according to a Certificate of Recognition from California State Senator Bob Wieckowski (D-Fremont). Over the past year, CWA representative Jose Espinoza of California Water Service served on the chamber board, chaired CWA’s Utility Supplier Diversity Program (USDP) Committee, coordinated its annual procurement community event (CONNECT: 2017) and revamped its 2018 Corporate Membership package, among other efforts. 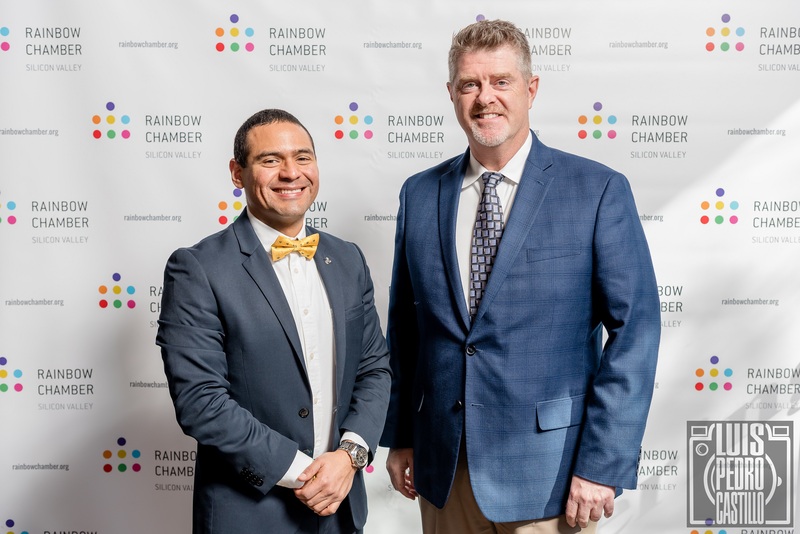 Jose Espinoza, Supplier Diversity Program Manager for California Water Service (left), and Timothy McLaughlin, Supplier Diversity and Community Involvement Manager for San Jose Water Company, accept the Corporate Member of the Year award from the Rainbow Chamber of Commerce Silicon Valley on behalf of the California Water Association.